ApacheCon NA 2011 - Geeky Paradise! ApacheCon NA this year was in beautiful Vancouver, BC. This conference, besides being my first ApacheCon, was really different from my usual trips since it was in my home country :) No customs and crazy exchange rates FTW! I think there were over 400 attendees so it was a pretty good turnout IMO. Lots of geeky chats, hacking and beverages made for a great time. The sessions were great too of course. I wanted to blog about my trip not because anyone finds my travels interesting :) but because the topics are really cool and are probably not widely known. I want to start off with my colleague Guillaume Nodet who spoke about how Fuse Fabric is created on top of Apache ZooKeeper and allows you to provision ActiveMQ, CXF, and Camel applications into a cloud of ServiceMix or Karaf instances. Very cool presentation overall but I was really quite excited by the prospect of upgrading a whole cluster of ServiceMix or Karaf instances to a new version of Camel. Right now, to upgrade at runtime you have to either update every bundle of Camel separately or uninstall + reinstall the new version (not very pretty). Fabric also has an super fast implementation of Distributed OSGi, which allows you to invoke OSGi services hosted in remote nodes. When on the same machine it can run at 25,000 MPS on pretty minimal hardware! I heard a bit about the TomEE project recently and thought it would be good to hear from the main guy David Blevins what it is all about. 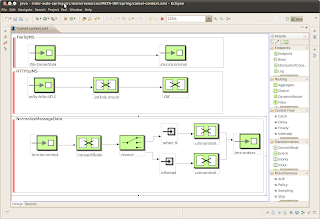 In short, at the Apache TomEE project they are creating a Java EE 6 certified server based on Apache Tomcat. They are doing this because they think that the EE spec is actually not bloated as people say (yeah, its just an API after-all) and that the bloatedness comes from the implementation of various vendors. So, they wanted to make a lean mean EE server. The other main point about TomEE is that it is built on top of Apache Tomcat, which is the most widely used web app server. On the bit about it being lean, apparently to run the entire EE TCK (that is the certification tests), TomEE only needed the default heap size of 64MB... now, I wonder what the other EE app servers required? Jean-Baptiste Onofre gave a great demo of Apache ACE in action. Essentially ACE allows you to provision your OSGi packaged apps into Karaf or ServiceMix instances. I thought it has a pretty slick web interface where you can centrally manage what Karaf nodes have what bundles, etc. Very cool stuff! OK, so there were many more talks as well but these were the ones I wanted to talk about :) Overall ApacheCon was one of the coolest conferences I've been too. Very happy to have hung out with some old friends and met some "IRC friends" that I've been wanting to meet for years. Oh yeah, and the next ApacheCon will be November 2012 in Germany... sounds fun already! There are a few things happening in October that'd I'd like to draw your attention to. We're cohosting a Fuse community day with Skills Matter in London, England. Rob, James, and Claus will be giving several talks on Apache Camel, ServiceMix, Karaf, and ActiveMQ. They'll also talk about some of the products that have come out at FuseSource this year like Fuse IDE and Fuse Fabric. As usual with Fuse community days, several customers will be joining to tell how they use these open source projects in real world applications, which IMHO is usually the most interesting :) Logica and Apex Networks will be talking at this event. This Fuse community day is in Paris, France. Much the same talks as at the London event with Atos Worldline and Capgemini joining to share their expereince using Apache and FuseSource open source software in real world applications. Last but not least ;) I'll be presenting a webinar on how to get started with Apache ServiceMix. In this webinar I'll take a tour of the many features shipped with ServiceMix. I'll stick with the getting started theme here too - it won't be a deep dive into anything so hopefully it won't go over anyone's heads :) For most of the talk though I'll head to the IDE and see how to build out a ServiceMix application that takes advantage of the main compoenents like: integration flows with Apache Camel, web services with Apache CXF, and reliable messaging with Apache ActiveMQ. So I'm really excited about CamelOne. It is a conference put off by FuseSource for users of Apache open source integration and messaging projects. So there will be lots of talks on Apache Camel, ServiceMix, ActiveMQ and CXF by the folks who created those projects and also users who push the limits of what the software can do. Great stuff. Gregor Hohpe, author of Enterprise Integration Patterns, will also be giving a keynote about the Past, Present and Future of Enterprise Integration Patterns. Apache Camel was designed to be deployable nearly anywhere; you have your choice of standalone in a JVM, Tomcat, J2EE, ActiveMQ, Spring, OSGi, and more. One particularly suitable deployment option is an OSGi container like Apache ServiceMix. In this session, Jon will show you how to take advantage of the many features that ServiceMix brings to the table and also how to best design your Camel applications to get the most out of OSGi. 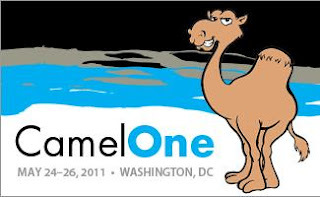 I urge anyone who uses Camel, ServiceMix, ActiveMQ or CXF and can afford the trip to attend CamelOne. It's going to be a blast and it would really be great to chat with fellow community members about these projects. An eclectic gathering of infosec people to hear awesome talks and have outrageously fun discussions! Our mission is to provide an inclusive, open environment for the sharing and collaborative discourse on topics that most interest you. Apache Camel is an open source Java framework that focuses on making integration easier and more accessible to developers. It does this by providing: concrete implementations of all the widely used Enterprise Integration Patterns (EIPs), connectivity to a great variety of transports and APIs, and an easy to use Domain Specific Language (DSL) to wire EIPs and transports together to form routes. Interacting with secure services and also hosting secure services is essential in most integration projects. In this session, Jon will go over the four categories of security features in Camel, which include securing: routes, message payload, endpoints, and configuration. On Friday I sponsored a team programming competition at Memorial University here in St. John's. 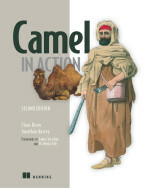 Like the previous competition this year, I presented a signed copy of Camel in Action to each of the 1st place winners. Congratulations to Melissa Reid and Ken Collingwood for winning! Full results of the competition were posted on Jamie's blog. This past Friday I sponsored a programming competition at Memorial University here in St. John's. Was a great turn out - much more than I can remember back in the day when I competed in these things... Jamie posted the full results since he helped organize the event. Looking forward to the next one in 3 weeks! Modern fiber manufacturing plants rely heavily on the use of automation. Automated facilities use sensors to measure fiber state and react to data patterns, which correspond to physical events. Many patterns can be predefined either by careful analysis or by domain experts. Instances of these patterns can then be discovered through techniques such as pattern recognition. However, pattern recognition will fail to detect events that have not been predefined, potentially causing expensive production errors. A solution to this dilemma, novelty detection, allows for the identification of interesting data patterns embedded in otherwise normal data. In this thesis we investigate some of the aspects of implementing novelty detection in a fiber manufacturing system. Specifically, we empirically evaluate the effectiveness of currently available feature extraction and novelty detection techniques on data from a real fiber manufacturing system. Our results show that piecewise linear approximation (PLA) methods produce the highest quality features for fiber property datasets. Motivated by this fact, we introduced a new PLA algorithm called improved bottom up segmentation (IBUS). This new algorithm produced the highest quality features and considerably more data reduction than all currently available feature extraction techniques for our application. Further empirical results from several leading time series novelty detection techniques revealed two conclusions. A simple Euclidean distance based technique is the best overall when no feature extraction is used. However, when feature extraction is used the Tarzan technique performs best.